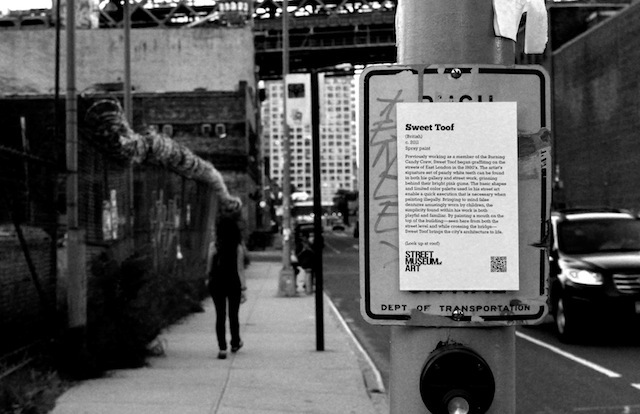 The Street Museum of Art (SMoA) has announced the debut of it’s first exhibit In Plain Sight. 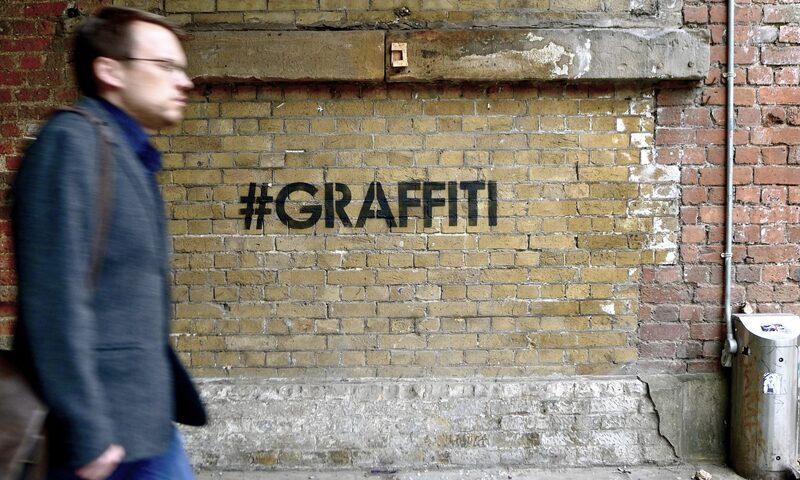 What that means is that some street art fan or fans have put up the outdoor equivalent to gallery wall labels in order to help identify, draw attention to and explain a few selected pieces of street art. ForIn Plain Sight, the curator(s) have included work by Sweet Toof, Faile, Gaia, JR and others. This could really easily come across as ridiculous and cheesy, but I think the SMoA have pulled off one of the best actions demonstrating both the necessity and impossibility of displaying street art in a museum setting. On some level, wall labels for street art are absurd, but on another level they are quite useful. And rather than trying to create some sort of fake and inevitably lesser copy of the street indoors (like the installations by Neckface or Todd James, Barry McGee and Stephen Powers at Art in the Streets) or organizing murals that again emulate some of the look of street art but not the energy behind it (like the murals organized for Os Gemeos recently in Boston), the SMoA have just brought the museum to the street, as if to say “Here is the real thing. It cannot be imitated in a museum environment. But it is as valuable to our culture as what you might see in MoMA.” Maybe the SMoA will help people to see things that they haven’t before, and then maybe they’ll start noticing street art everywhere without the help of wall labels.In Plain Sight elevates street art both to make a strong statement about the art and benefit viewers. It’s like a mini version of the street art tours that Stephanie and I have offered in London, but free and self-guided. Great stuff. The one disappointing thing I have found about In Plain Sight is that it takes place in Williamsburg. Of course there is a lot of great street art there, but I think a lot higher proportion of Williamsburg residents are probably aware of street art already. But hey, even a jaded hipster might be willing to learn something new about Sweet Toof if the text is right in front of her. I’m curious to see what the SMoA does next. Also, I’d like to compare what the SMoA is doing to what some street artists in Australia did last weekend. There’s more info and a more positive view of the petition over at Invurt, and I think Luke may be writing something about it as well in the coming days for Vandalog. But I just thought I’d bring up that comparison of two groups almost simultaneously trying to make a point about the legitimacy of street art as art that should be appreciated by people and supported by the state or institutions, and making that point in two very different ways. The Trojan petition seems to take a very negative approach and the SMoA takes a very positive approach. Which one do you like better? Although I can enjoy anger from time to time, I think SMoA made similar points a hell of a lot better by staying positive and improving the streets.